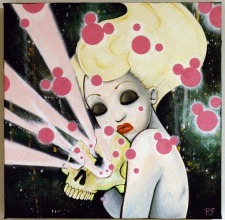 I have 2 paintings in the group show Dirty Pop which takes place tomorrow night at Box Studios. The artist list has some of my favorite names on it, so I know it will be a fun night. You can RSVP on the Facebook event page here. An exciting addition to this show is the Box Set auction. In an effort to raise money for The Intermediate Remedial Program which operates in East Vancouver, 9 artists were given canvases & asked to work their magic. 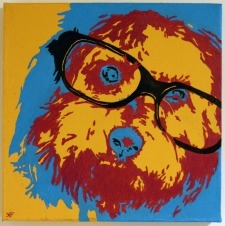 These 9 paintings are being sold and proceeds donated to The Intermediate Remedial Program. 10 youth, aged 8-13, who suffer from neglect and abuse, who struggle in school with anger management and behavioural issues have been selected for this program with the intent of reintegrating them back into regular classrooms. They are hoping to start an art based therapy workshop with these students. Click here to see the other pieces or place a bid!